Every well-stocked library has a shelf—perhaps many shelves—dedicated to the life and works of Dr. Martin Luther King, Jr. From biographies to the man’s own writings, the world has many ways to come at the legacy of the great civil rights activist and Baptist preacher. At Northwestern University Libraries we are fortunate to supplement those volumes with the rare and unique holdings of our Distinctive Collections libraries. These are the artifacts that mark Dr. King’s influence, whether on this campus or around the world. One of the research specialties of the McCormick Library is the politics of the 1960s, from the brochures of antiwar activists to the periodicals of the countercultural movement. The struggle for civil rights figures prominently in this collection, including items that highlight not just Dr. King’s writings but the writings of others moved by him. For example, this print of a poem by Gwendolyn Brooks (above left) is number 92 of a limited series of 200. 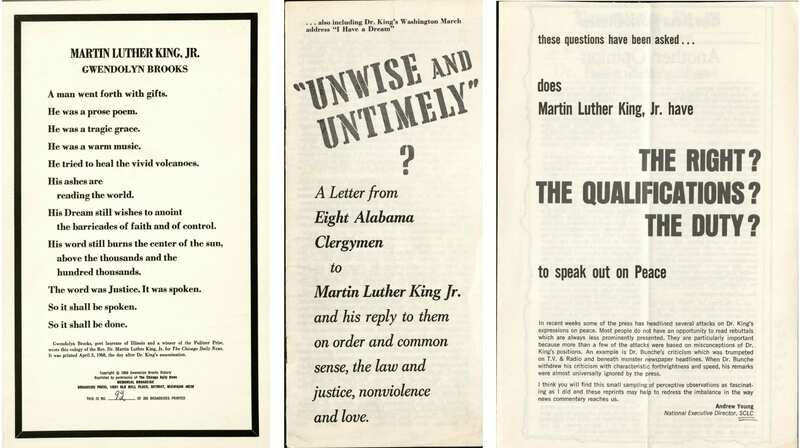 It can be found in the McCormick alongside such pamphlets as this publicized dialog between Dr. King and eight other religious leaders (center) and a defense of Dr. King written by Andrew Young, the then-executive director of the Southern Christian Leadership Conference. The McCormick also holds an eclectic of array of media, including the 1957 comic book “Martin Luther King and the Montgomery Story,” published by the Fellowship of Reconciliation. This version is in Spanish, proving how wide Dr. King’s inspiration was spread. The vinyl LP “We Shall Overcome” is a recording of the speeches and musical acts at the famous March on Washington, Aug. 28, 1963. It features speeches by now-U.S. Representative John Lewis, civil rights activists Whitney Young and John Farmer; performances by Joan Baez and Bob Dylan; and Dr. King’s most famous oration, the “I Have a Dream” speech. The Archives are the home of campus history. And the history was made at Northwestern — really in all of the Chicago region — on April 15 and 16, 1958, when Dr. King came to Evanston. He delivered two lectures as the guest speaker at Northwestern’s annual Mars Lecture Series in Progressive Christianity. The Herskovits specializes in items from the African content, of course, but its holdings will extend to Evanston when they intersect with Northwestern’s Program of African Studies or other relevant campus events. 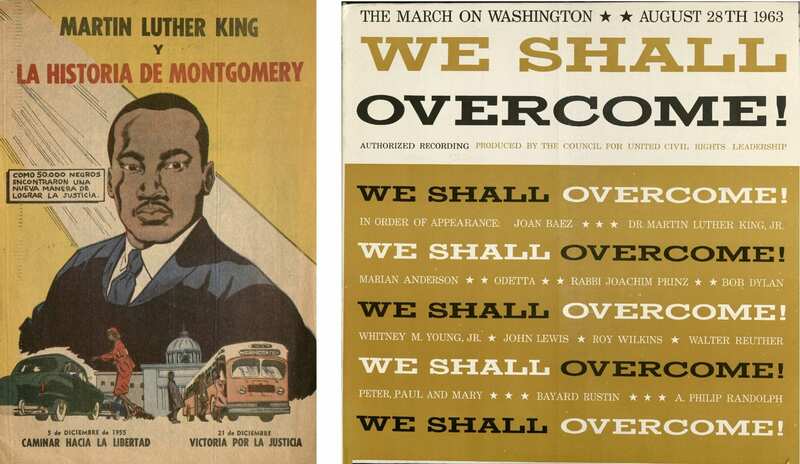 The above posters come from campus events in 1990 and 1972, respectively, one for a candlelight service held by Alpha Phi Alpha fraternity, the other a week celebrating African culture by the Program for African Studies. 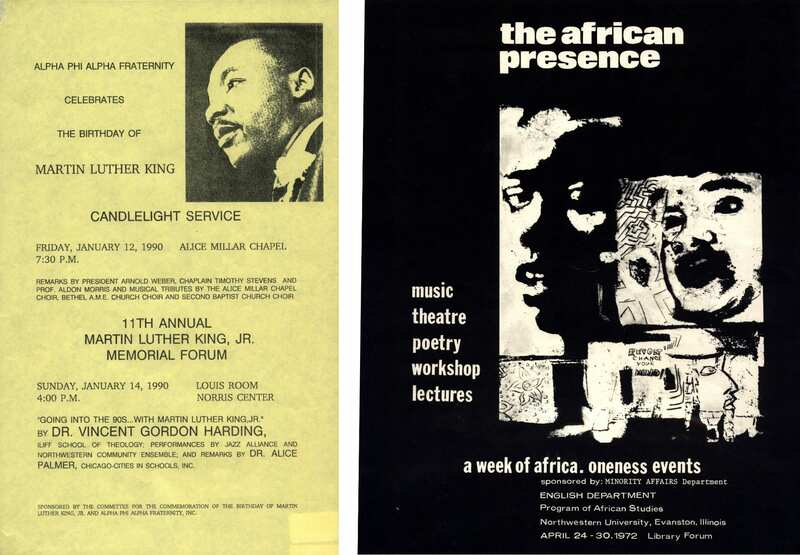 Though the “African Presence” event isn’t directly related to Dr. King, our cataloguers noted that the top right illustration is “arguably” based a photo of Dr. King, which was an unexpected way to discover his name in our holdings. 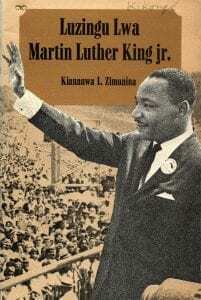 The compact paperback “Luzingu Lwa Martin Luther King jr.” is a 1973 biography from Zaire, written in the Bantu language of Kikongo, and much more expected way to encounter Dr. King in this international collection: As yet another language into which the doctor’s message has been propagated. Music students have a great resource in the Northwestern Music Library. Here they have access to tens of thousands of scores for study or performance, with a particular strength in 20th- and 21st-century music. Here you’ll find themes written to invoke Dr. King and his teachings, with scores such as “Dr. Martin Luther King: In Memoriam” (Roger Kellaway, 1973) and “I Have a Dream” (Lee Hoiby, 1988). The Transportation Library at Northwestern is one of the largest of its kind in the world, collecting transportation research materials that address socioeconomics, technology, regulation—and yes, even Dr. King can be found here. One of the essential holdings of the Transportation Library is its enormous collection of federally issued environmental impact statements, which document potential effects of civic construction projects. Often, these are the kinds of large projects named to honor famous figures. 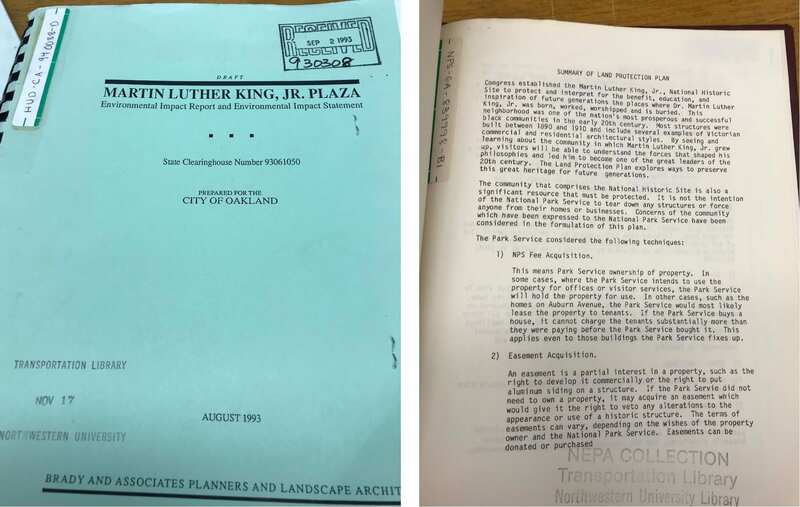 Here we can find evidence of the kinds of projects built to memorialize Dr. King, such as the Martin Luther King Plaza in Oakland, Calif., (1993) and the Martin Luther King Jr. Historic Site in Atlanta (1983). Projects of this magnitude memorialize the impact of the man as surely as any statue or biography. This selection is just a sampling. No matter where you turn in Northwestern Libraries, evidence of the teachings and influence of Dr. King are ever-present, reminding us that the legacy of this man can’t be contained by a single day of remembrance. Our Libraries, like the rest of Northwestern, are closed on Martin Luther King, Jr. Day every year. But when they reopen on the following Tuesday, more discovery awaits those inspired by the words of one of the world’s greatest thinkers, speakers and leaders. Many thanks to Kathleen Bethel, African American Studies librarian, who contributed to this article and pulled these items from our collections.